A process server has shown up to your home to deliver a summons and complaint or you’ve come home to find a summons and complaint taped to your door? You’re being sued but how long do you have to file your answer? 30 days if the summons was not personally delivered to you (i.e. delivered to another person in your home or posted to your door). The key to measuring your time to answer the summons is knowing when “service is complete” because it is at this moment when the 20 or 30 day clock starts to tick. If service of the summons was delivered personally to you – service is “complete” and the 20 day clock starts to tick as soon as the papers are handed to you. The timeframe is much less clear if service is by other means. Pursuant to CPLR §308(2), if the summons was not personally delivered to you, service is “complete” 10 days from the date when the affidavit of service is filed with the court. 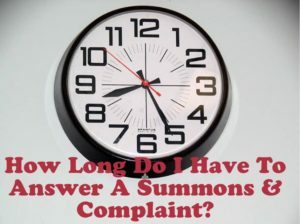 So to calculate how long you have to answer a summons and complaint after service other than personal service – you must first learn when the affidavit of service is filed with the court. You then add 40 days to that date and that is when your answer is due. Excuse the double negative but most importantly, don’t do nothing. If you fail to answer the summons and complaint you will have a default judgment entered against you.